This morning I started with white washing the walls inside the garden house. All the painting of the outside and the doors and windows inside is done!! For white washing the walls I use very watery paint and a cloth. A neighbour offered to white wash the ceiling because that's too much for me to do because of the fibro. The saying 'it is the last straw that breaks the camel's back' is totally true. I'm really fed up with painting and I feel tired. And besides that: I WANT TO SCRAPBOOK AGAIN!!!! 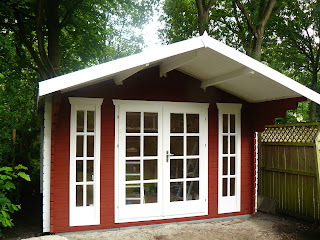 Have fun with your new gardenhouse!! You deserve it after so much hard work!